Nature is the biggest inspiration for drawing any designs. Taking the bunch of grapes as inspiration this drawing is done. 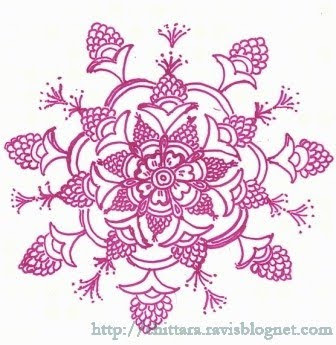 Started with a Flower at the center keep adding the grapes like a bunches around it. Finally we got this. This design can be used for floor designs for large halls, living room etc. This design can also be embedded in sarees as a small designs. If we cut the portion and pick the bottom three bunches it looks great for jewelery.